Outstanding Soviet and Russian Actor of theater and films. Art Director of the Moscow Art Theatre. Founder and Art Director of the Tabakov Theater. People’s Artist of the USSR. 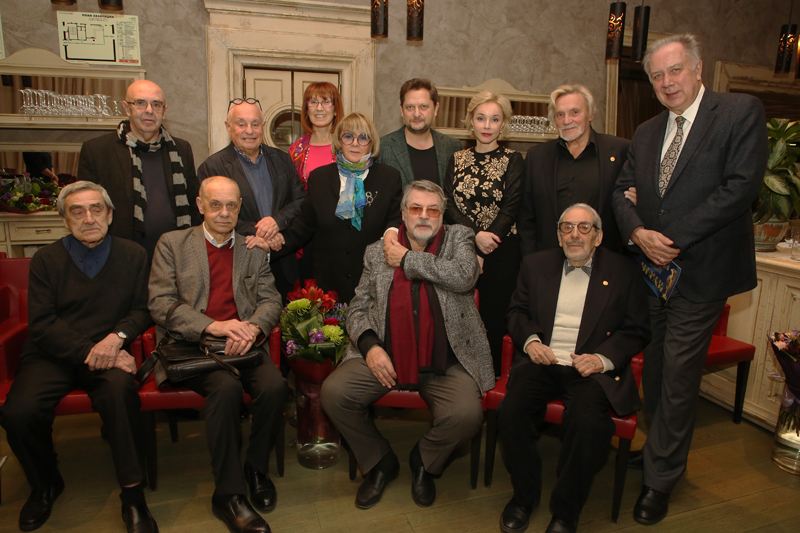 USSR State Prize Laureate, State Prize of the Russian Federation Laureate, Chaika Prize Laureate, Mayor of Moscow Prize Laureate, Crystal Turnadot Prize Laureate, Golden Mask Prize Laureate, Moskovskij Komsomolets Prize Laureate, Argumenty i Fakty Readers’ Pride of the Nation of Russia Prize Laureate. Companion of the Order of Merit for the Fatherland (1st, 2nd and 3rd class), Order of the Red Banner of Labor, Order of Friendship of Peoples, Order of the Badge of Honor. Member of the Council for Culture of the President of Russian Federation. Oleg Tabakov was born on August 17, 1935 in Saratov in a family of doctors. His first character was Storyteller in The Snow Queen, a spectacle performed at the Saratov Palace of Pioneers. He was a drama school student at that time. His professional debut was a bit part of a principled student Misha from Forever Alive, the first spectacle of a little theater Sovremennik. Young Tabakov was often offered roles of good characters. He was a very charismatic man with a nice looking face and a trustful smile. He kept his inartificial look for a long time and that let him appear in the roles of teenagers. Such as Oleg Savin from A Nosy Day based on the In Search of Joy play by Victor Rozov. Oleg was an honest, kind and sensitive young man. Though, he also was hot-tempered and intolerant of boorishness and spite. A person of bright thoughts and plain dealing. The same goes for Victor Bulygin from Men on the Bridge, Sasha Egorov from The Trial Period and Seryozhka from Clear Heaven. Then there were Nikolai Rostov from War and Peace and Kolya Babushkin from Young-Green. These are the best parts played by young Oleg Tabakov in films. He proved to be a universal actor able to appear in any part, be it romantic Iskremas who believed in ideals of a revolutionary theater (Shine, Shine, My Star) or a petty and narrow-minded Lieutenant Kruglikov (The Alive and the Dead). Such diversity remains a trademark of Tabakov. His service record consists of such great masterpieces as The Variegateds Case; On the Eve; The Bridge Is Built; A Pistol Shot; Shine, Shine, My Star; King of the Reindeer; The Polunin Case; Russia’s Heart; The Property of Republic; Seventeen Moments of Spring; Unfinished Piece for the Player Piano; The Twelve Chairs; Oblomov (Oxford International Film Festival Award for Best Actor); Moscow Does Not Believe in Tears; Ah, Vaudeville, Vaudeville; The President and his Granddaughter. It was just a part of the whole list. One of the most successful Tabakov’s characters in theater became the leading part of Aduev Junior in Ordinary Story, a spectacle directed by Galina Volchek. His view on classics opened a brand new horizon for new generation of actors playing classical parts. Today Oleg Tabakov already appears in the role of Aduev Senior and the audience of Tabakerka always rises in applause. There are several gems among his works at the Sovremennik Theater: Balalaikin (Balalaikin and Co): Fyodor, the Driver (Suburban Anecdotes): Egor Polushkin (Don’t Shoot White Swans)-, Stoker (And They Woke Up in the Morning). After joining the Moscow Art Theatre Oleg Tabakov performed some classical parts: Salieri (Amadeus), a talented man fatally poisoned byenvy;Sorin (The Seagull), Famusov (Woe from Wit). At his home Tabakerka, Oleg appears in The Last Ones, Matrosskaya Tishina and Anecdotes. He is still very bright, sharp and wild. Another side of his profession is voice acting for animation. Matroskin, a wise and egocentric cat from Prostokvashino village voiced by Oleg Tabakov became an all-time favorite among children. Stanislavsky called charisma «the greatest sign of the actor’s gift». If it’s true then Oleg Tabakov is one of the most gifted Russian actors. And yet his main character is himself. It’s the image of a winner. He is a lucky man. He is able to have both the carrier and the fortune. Day by day he builds his own fortress called «Oleg Tabakov».